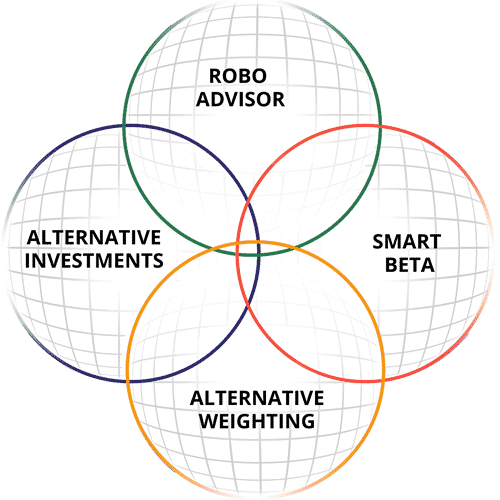 At the intersection of Smart Beta and the Robo Advisor, our strategies, powered by Gsphere portfolio technology, drive performance and create a differentiating platform for your success. Our inventions for diversification optimization, visualization and measurement combine with a 14 year legacy of technology development and leading edge, alpha generating, research-proven techniques that are built into our Gsphere.net portfolio technology platform. GSphere powers our strategies and enables amazing collaborations with advisory firms to systematize, optimize and automate their strategies. In turn, many of these advisory firms leverage our integrated technology platform to create analytics, proposals and reports for their top clients, and provide new opportunities for business growth. Are you interested in learning more about Gsphere technology and possible licensing options?